After some running around this afternoon, making dinner, and cleaning the house I made sure to have a pretty low key evening. 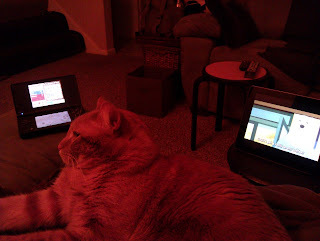 Just some poking around on the DS with a stylus, a round-ish orange cat, and some anime. 1428/365 - So. Many. Treats. 1415/365 - Who Needs HBO?